SEOUL, Aug. 13 (Yonhap) — Los Angeles Dodgers’ Ryu Hyun-jin has taken a no-decision after throwing his worst outing in two months. 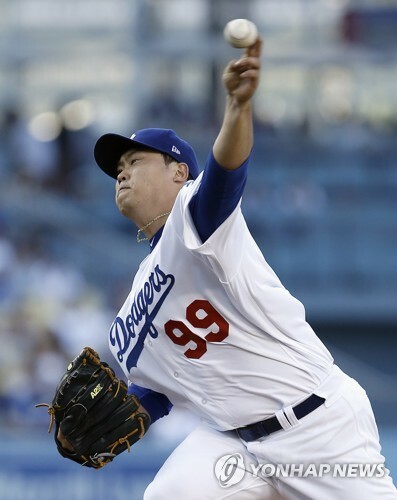 The South Korean left-hander allowed three runs on seven hits in five innings against the San Diego Padres at Dodger Stadium in Los Angeles on Saturday (local time). He left the game with the Dodgers trailing 3-1 through five, but they rallied to beat the Padres 6-3. Ryu walked two and struck out five in his seventh no-decision in 17 starts. Ryu remained at 4-6, while his ERA went up from 3.53 to 3.63. This was the first time since June 11 against the Cincinnati Reds that Ryu allowed more than two earned runs in a start, a span of seven outings. Ryu entered the game on a 15-inning scoreless streak. He kept the Padres off the board for the first 2 2/3 innings, before allowing back-to-back doubles to Jose Pirela and Hunter Renfroe with two outs in the third. Renfroe’s hit tied the score at 1-1, after the Dodgers scored first with Justin Turner’s sacrifice fly in the bottom of the first. The Padres went up 2-1 in the fourth, when their starter Jhoulys Chacin helped his own cause by dumping a single to right field. With two outs in the fifth, Wil Myers launched a solo shot to right center to give the Padres a 3-1 lead. It was the first home run given up by Ryu since June 28 against the Los Angeles Angels. It was also the 16th home run allowed by Ryu in 2017, his single season career high. Ryu tossed a season-high 108 pitches, only 68 of them for strikes. He was lifted for pinch hitter Kyle Farmer in the bottom fifth, and left-hander Tony Watson took the mound to start the top sixth. Ryu had been 4-1 with a 2.19 ERA in his six previous starts against the Padres, with 36 strikeouts in 37 innings. The Dodgers erased the deficit in the bottom sixth as Corey Seager plated three runs with a bases-loaded single. Cody Bellinger extended the lead to 5-3 with a solo home run in the bottom seventh. Chris Taylor gave the Dodgers another insurance run with a solo blast of his own in the eighth. Closer Kenley Jansen threw a scoreless ninth to preserve the 6-3 win. I read this Blog . Excellent. Please keep up the good work. Thanks.